STEM books are hot topics now and every parent wants their child to be a mathematical whiz, if not a genius. 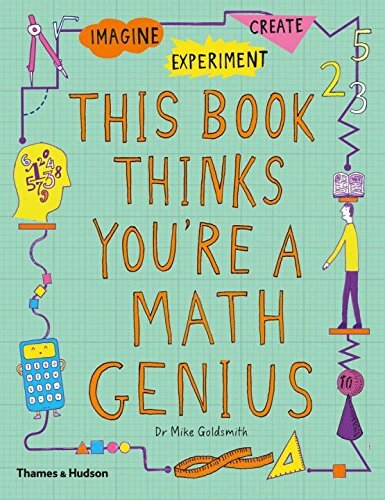 The problem with the title of this book is that it suggests that enjoying math isn't enough—you have to be brilliant at it. Not, I'm sure, the author's intention, which is in fact to show how fun and accessible math can be. Whether it succeeds in doing that is another question. The book starts with tessallation and would have been enriched by mentioning the master of tessellation, M. C. Escher. Some of the math here seems too complex to be shoe-horned into such simplistic explanations, like topology and “pursuit curves.” For a book that tackles math in a more kid-friendly way (though not an activity book), look at David Schwartz's G is for Googol. He explains the Konigsberg bridge problem, binary systems, and Fibonacci sequences in a more accessible and playful way. For a longer book that makes math both fun and exciting, all wrapped in a story, check out Hans Magnus Enzensberger's The Number Devil: A Mathematical Adventure. But if a workbook appeals to you, this one offers origami, puzzles, and doodling. The more successful pages deal with codes and ciphers, patterns, and mazes. If this book spurs you to want more or if you want to skip the workbook entirely and create your own, get some grid paper and look at Vi Hart's Youtube videos. To really engage young mathematicians and doodlers, no one does better. She has many Youtube videos showing how she combines math and doodles in an engaging way, echoing the way kids think as they draw. Check out her spiral doodles, her hexaflagons, and her Fibonacci sequence. Watching her, your fingers itch to pick up a pen and follow her designs. Before you know you it, you'll be pages-deep in math without feeling mathematical at all. And no workbook needed! But if you are an adult looking for a gift to encourage a math-adverse child, you might try this book. If you ignore the title and the over-indulgent praise it suggests, the actual contents show how math can be found in the kind of puzzles and mental games kids might actually like to play. I give this book four stars for premise, three for content, and one for the title.